Hon. 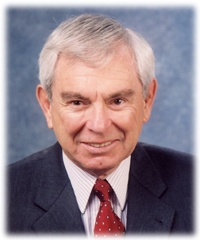 Raymond F. Zvetina (Ret.) brought more than 40 years of experience and built a successful mediation and arbitration career during his 10 years with JAMS. One of our most respected and admired panelists, he was always praised by clients for his preparation, fairness and his quick wit. Judge Zvetina was appointed to the Superior Court bench in 1989 after a 28-year career as an attorney. He served in San Diego’s North County branch for about 13 years and handled cases involving virtually every area of law while on the bench. Prior to practicing law, Judge Zvetina served in the U.S. Navy and even gave acting a brief stint in his native Chicago. He once said that the thing that drew him to the legal profession was acting. Judge Zvetina will be remembered for his sense of humor, brilliant mind, kindness and commitment to ADR. He is survived by his wife and four children. JAMS and the ADR community will greatly miss him.